Guatemala’s 2008 International Birding Encounter truly was a once-in-a-lifetime experience, an adventure I’ll always remember as much for my fellow participants as for the absolutely mind–blowing birding. While I’ve endeavored to keep the name-dropping to a minimum, the truth is that most of the people I spent time with are famous (or notorious) in some part of the world or another for their outstanding contributions to the birding industry. My morning in Cerro Cahuí is a perfect example of the kind of talent thrown together for this singular excursion. 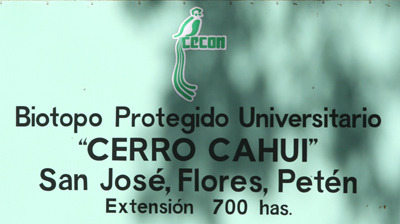 Cerro Cahuí Protected Biotope, located on the road to Tikal, is a gem in the Tehuantepec Moist Forest Ecoregion. The narrow track is best suited to a few people at a time, so once the minivans disgorged our eager contingent, we broke into smaller exploratory teams. It was my brilliant luck to fall in with a truly tremendous troupe, one that included a man who knows his way around the Mesoamerican forest as if he were born to it (Jeff Gordon) and his charming, chachalaca-loving companion (Liz Gordon), both a blast in any setting. It had been my pleasure to get to know Jeff and Liz at the Cape May Autumn Weekend last year, where I also met Lisa White, Houghton Mifflin editor of Good Birders Don’t Wear White and a slew of other essential birding books and guides. A couple that I hadn’t met until the Encounter, despite having an online relationship with both of them for years, were Julie Zickefoose and Bill Thompson, III. I don’t think I need to explain who Zick and BT3 are, as their prodigious reputations no doubt precede them, but I’ll be happy to confirm that they’re even funnier, sharper, and warmer in person than you’d imagine. So there we were… a bona fide birding dream team, plus me, led by a crack local guide. All that we needed were some birds! Alas, the birding was slow to start. 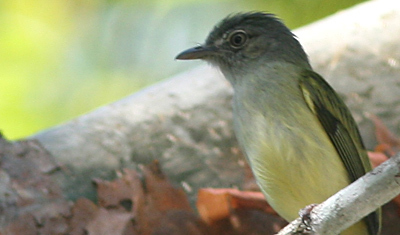 Of course, we heard plenty of alluring species but all we saw, it seemed, were waves of White-eyed Vireos. Plain Chachalacas, Black-headed Saltators, and other noisy, but common species turned up too, as did a bevy of North American migrants, mostly Magnolia Warblers, Baltimore Orioles, and the aforementioned vireos. But Cerro Cahuí could not long keep its secrets from this crew. First came flycatchers like Yellow-Olive, Yellow-bellied, and Ruddy-tailed Flycatcher and elaenias both Yellow-bellied and Greenish. Next we spotted stray charmers like Blue-crowned Motmot, Melodious Blackbird, Grey-headed Tanager, and Olivaceous Woodcreeper. 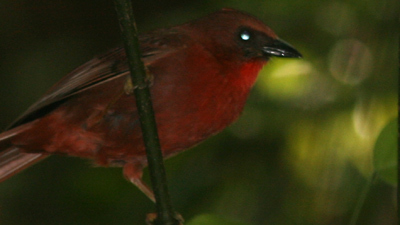 Then finally, we got into some birds specializing in following ant swarms, cool birds like the Red-throated Ant Tanager and its close relation, the Red-crowned Ant Tanager. Of these two bright and burly tanagers, the latter was new to me but the former far more confiding, even cloaked in shade. Before you knew it, this habitat was rolling highlight reel after highlight reel, one dream bird after another. 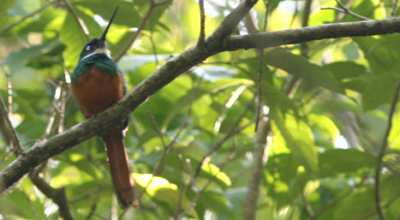 Due in large part to Jeff’s neotropical know-how, we observed Rufous-tailed Jacamar followed closely by Grey-throated Chat, both real “killers” as Julie put it. Through a break in the trees, we pulled some scarce raptor sightings, Plumbeous and Hook-billed Kite in close succession. By the time we spied Bright-rumped Attila (reputed to be the only flycatcher named for a Hun) and Great Crested Flycatcher in the canopy, the hunt was well and truly on. Too bad it was time to turn back! The shame of a narrative such as this is that there’s no way to give each species the respect it deserves. I mean, the Rufous-tailed Jacamar is a Big Deal Bird, while the Grey-throated Chat had seasoned veterans sprinting frantically down the path for a glimpse. And yet as good as they were, one of the birds I remember best is the one that got away. Don’t get me wrong… plenty got away! One, however, was inexplicably higher than the rest on my most-coveted list. The Long-billed Gnatwren is a tiny, rather unremarkable member of the gnatcatcher family; perhaps its only claim to fame is that it is the only member of the genus Ramphocaenus. Nonetheless, the gnatwren captured my imagination, which is why I was so thrilled when we stumbled upon one on our way out. The problem is that I couldn’t lay eyes on it, despite the best efforts of my compatriots! Bill of the Birds, a true prince among birders, pulled out all the stops, including his Jedi laser-pointer, to no avail. I saw Blue-grey Gnatcatcher, I saw Barred Antshrike, but I did NOT see Long-billed Gnatwren. That’s what next time is for, right? On a more hopeful note, I did spot both Ivory-billed Woodcreeper and Pale-billed Woodpecker, within minutes of each other, which is probably as close as anyone can expect to get to a live Lord God Bird sighting, particularly in Guatemala! Thanks for quick mind-trip back to the tropics…that really was a great morning. Long-billed Gnatwren, goin’ down–next time. So you really didn’t need to see a Yellow-bellied Flycatcher last year in the Adirondacks…you could have just waited until Guatemala! True, Corey, but what about that all-important ABA list? Now, if we had managed 60 lifers in the Adirondacks like I did in Guatemala, I’d be more inclined to agree!